The NPCs we fight in PvE are well known to be lack luster and are designed nor supposed to be major 'content'... they are there to be farmed for ISK and that's really all they are for... mining just with guns and 'rocks' that shoot back is about it. Even C6 Sleepers can be farmed, once you have the manpower and tools needed. No, the only real villains in EVE are the players, because the players are the only real content. 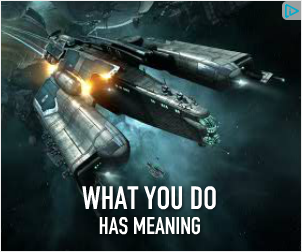 EVE aint yer dad's MMO... and those who come to EVE expecting to fight NPC bosses and hordes are always sadly disappointed... and I believe that even within CCP Seagull's vision of EVE, they always will be. Somebody's gotta be the bad guy in th' sandpit... or it won't be a real sandpit... just WoW in Space. To get the full affect of the advert you have to consider it in context. 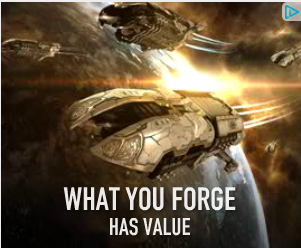 You wander onto a web page where panel 1 “What You Forge Has Value” appears. Panel 1 is then replaced by panel 2 “What You Do has Meaning.” That panel is then replaced by “Be The Hero” which is then replaced by “Be The Villain” where things then linger . . . unless you reset it. “Be The Villain” may be only ¼ of artwork but in practice it gets much more than ¼ of the time. You are correct, “Be The Villian” is not the entire focus but as you note it is the final card played and it does end up getting the bulk of the time. Little surprise so many experience the first three panels as mere set up for the forth coup de grace panel. You too are correct, “Somebody's gotta be the bad guy.” That being said, the appeal of the advert isn’t that there will be genuine bad guys afoot but rather that “Somebody *gets* to be the bad guy” - even you. More importantly villainy - your villainy - has meaning . . . and value . . . .
except that "be the villain" is dragged out in an to excuse for the excess of the bonus room. Being a villain within Eve is relativity easy, There is a distinct shortage of willing heroes. CCP has done a horrible job of even LETTING people be heroes. The core game mechanics do not allow it unless you use the wardec system or suicide gank ... putting you more of an anti-hero role. It is a shame the game, which continues to call itself a sandbox hasn't actually made a sandbox game ... its a non-consensual PvP game ... but you can not market that. Framing villain/hero as some kind of moral meter or jedi game force sides mechanic seems a bit off to me. The really interesting thing about the EVE social sandbox is that as in real life person is villain for some and hero for others and the way action is perceived depend on your relationship the action and the actor. IRL, there are real consequences. EVE should allow complete freedom, but also have CONCORD that makes sense. 1. If your Sec Status is below 0, you are locked out of all Hi-sec Stations. Pods included. 2. At some lower value (-2?) Your assets in Hi-sec are impounded. 3. As Sec status drops, these penalties start applying to low-sec stations as well. 5. Agents in Low and Null that allow you to (slowly) repair status. 6. Assets, including ISK, cannot be transferred from positive status to negative status pilots or vise versa. In other words, if you act like a irredeemable psychopath, you are treated as such. Crimes have sec-hits proportional to sec-status of the victim and the magnitude of the crime. Ganking a frig piloted by someone with 0.5 sec status has a small hit. Ganking and podding an unarmed industrial or freighter piloted by a 5.0 sec merchant is a huge hit. ONLY placed by CONCORD, not players. Substantial payouts, only collectable by positive sec status pilots. All of this is off-the-cuff, just ideas for a general outline of a more meaningful system of morality and criminality in the game. I would prefer to have a mechanic that *does* let you "be the hero" (since it would be better gameplay to let the players decide things instead of CONCORD), but if that wouldn't/couldn't be implemented this would probably be the next best thing. I don't know if the space-order is that important. One has to come first because most readers don't read two lines at once. If they had flipped the order would we have thought anything of it? Good is the normal default and is usually said first in a sentence containing the two. I think we are all over-analyzing it. 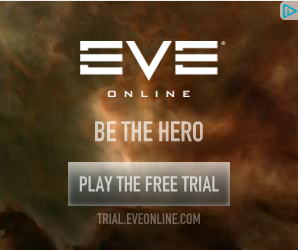 It's probably supposed to say only : "be someone that matters, whether good or bad"
The problem is not just the advertisement, but the overall message that EVE sends to its players. It often seems that there are many incentives and few penalties to being the villain, while few (if any) incentives and far too many penalties to being the hero. One style of play produces very high risk with little prospective reward, while the other is much more limited in risk with significant reward. The balance is off, and that skews play to one side of the line. The key issue with this being that in many parts of EVE, if "righteous players" go after the "griefers," they then suffer the same penalties as the griefers themselves. The end result is that the "heroes" in EVE are discouraged from acting heroically, or are often changed into griefers themselves.